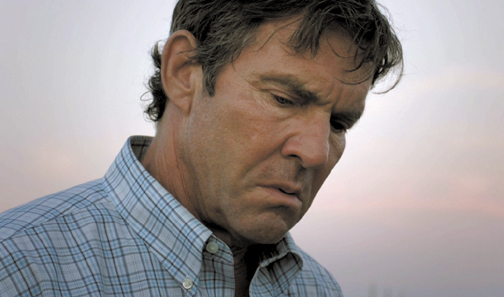 Henry Whipple (Dennis Quaid) is an American farmer of the new breed, a third-generation corn-growing con man, struggling, not just to stay viable in the fast moving, ever changing board game of big agriculture, but to gobble up more than he can chew and let the bodies fall where they may. Expand or die, is his motto, with a touch of go big or stay home. He goes out each day, racing down the endless rows of corn stalks, like a Carhartt Elmer Gantry, to hustle the last of yesterday’s farmers out of their aging ground. With his bored son in tow, he stalks the local funerals to pluck up some more land from relatives of the deceased. In this time of grief, he intones, I can take this burden from your shoulders. Henry has a spread of 3,000 acres his grandfather created, his father sweated over, and with too many aches and pains, has left it all to Henry, who wants to pass it to his two sons. Henry comes across as a good old boy who just plays rough pool, but there’s something darker here, a hunger for bigger, to be numero uno. Henry talks in big phrases right out of the Dale Carnegie playbook, thumping his fist in his hand and back slapping his customers. Expand or die, is his motto. Always close, he tells his son, who stares at him with squinted eyes like his father is a 1930’s carnival barker, which, he very much is. Instead of dancing girls, Henry pushes the new GMO (Genetically Modified Organisms) seed to the smaller farms that are about to become obsolete. Each year he throws a customer appreciation barbecue on his farm. Henry sells the Liberty Seed to a large group of Iowans, and appears to be doing well. But in the past couple of years when things got slow, Henry cut a few corners. There are adjustments in his books that need to be expunged. There is trouble at home: The oldest has fallen in love with long distance, probably, we suspect, to put distance between himself and Pop, and is down Argentina way trying to be a mountain climber. We never meet him, only hear his post cards being read by Mom (Kim Dickens). The youngest, Dean, (Zac Efron) has caught the speed bug and lusts to be a race car driver. Dean, it seems, will do anything to fuel his dream, and is not beyond a bit of small town breaking an entering to do it. Deeper into the film, happy land turns dark, and the sins of the father and son ooze out of the shadows. Henry is cheating on his wife, with an aging high school cheerleader (an excellent Heather Graham) who is also behind the barn with son Dean. Mom knows and watches through half-closed eyes. She is sweet as pie, an all loving mother and wife. Does she have a Lady MacBeth button somewhere in her heart? Wait and see. Former boy toy Zac Efron, teenies will be happy to know, is still cute and blue eyed and a bit tanner. I might add that he’s improving as an actor, but don’t get excited. Kim Dickens, a smooth actor, is wasted as the mother. In HBO’s “Treme” she plays a smart, tough top New Orleans chef and hammers it. Red West, as Henry’s father, by the way, steals every scene he’s in, especially with his raw realism juxtaposed with Quaid’s excess. Chelcie Ross as Zac’s teen girlfriend is chock full of promise, a corn-fed Sissy Spacek. Ramin Bahrani is clearly a competent director, even with way too many corn field shots, and his script written with Hallie Elizabeth Newton unfolds nicely for quite a spell, leading us to think we’re watching a tale of the trials and tribulations of farming. Then, 15 minutes before the end, a shocking and unexpected tragedy occurs, and a choice is made that locks our family together in a shadowy future.